Chance Warmack, OG from Alabama; instead the Titans picked him with the 10th overall pick. I think that Chance Warmack and Jonathan Cooper were rare prospects at Guard that happened to line up with a huge area of need. I was surprised Warmack fell to us at 9 and was very disappointed that we didn’t draft him. I would have been happy with any of the top 5 CB’s in this year’s draft and we could have landed one of them in the second round. We could have added a future pro-bowler to Mangold and Richardson and really gone a long way to solidifying our Offensive Line. Jarvis Jones, OLB from Georgia; instead the Steelers picked him with the 17th overall pick. Outside Linebacker has been a big area of need that we’ve been neglecting for the last several drafts. I’m still not over passing on Melvin Ingram last year. In this year’s draft, I thought there were three OLB’s worth taking in the first round. With Jordan and Mingo off the board, I thought we should have drafted Jarvis Jones. He was the anti-Gholston. There were a lot of reasons for concern with him except when watching him play. He was a highly productive and dominant player against excellent competition. I’d welcome him to my team any day. Johnthan Banks, CB from Mississippi State; instead the Bucs picked him with the 43rd overall pick. While I would have much preferred my draft to the one that the Jets actually had, I sincerely hope that I am wrong. I did not agree with drafting Geno Smith in the second round despite his perceived value at that spot. I actually would have much preferred taking Nassib in the 4th round if we had to take a QB. While QB is certainly a huge area of need, I would have preferred to give Tebow and Garrard a chance this year and draft a QB next year if needed. We just have too many holes to fill this year and the likelihood that any of the QB’s in this year’s draft class would have an immediate positive impact is, in my opinion, doubtful. Keenan Allen, WR from California; instead the Chargers picked him with the 76th overall pick. Having Keenan Allen fall to us in the third round was a big surprise and I think that we should have jumped at the opportunity to add such value at that spot. Trade pick to the Saints for Chris Ivory, RB. Well done Jets! 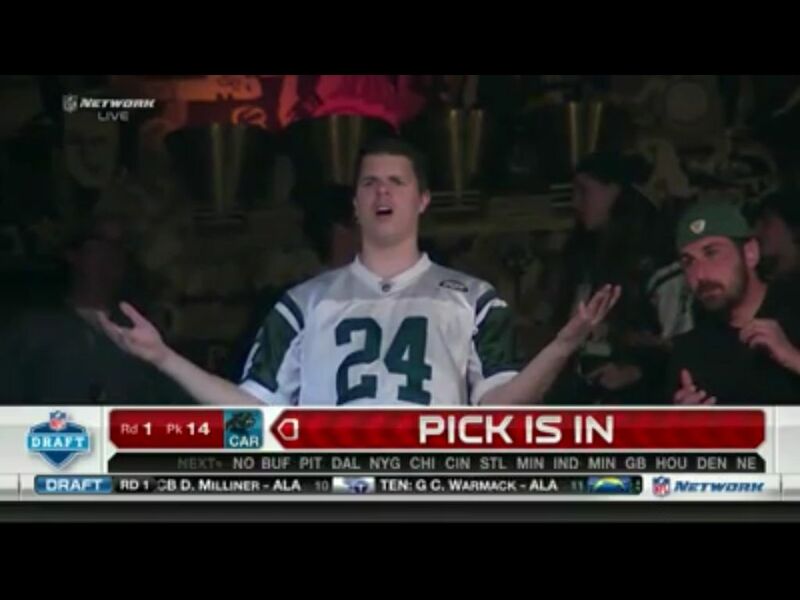 I love what the Jets did with their 4th round pick. I think that Ivory was the Saints’ best running back on their roster but because he was an undrafted free agent and the Saints had traded up in the first round to draft Mark Ingram, have a $14M contract with Sproles, and have an established producer in Pierre Thomas, Ivory never had a fair shot at the starting job. I think he will excel when given the opportunity to be the number one RB and is better than any RB we could have selected in the 4th round or that we had on our roster. Josh Evans, FS from Florida; instead the Jaguars picked him with the 169th overall pick. Michael Williams, TE from Alabama; instead the Lions picked him with the 211th overall pick. Safety and Tight End are areas of need that obviously didn’t get addressed in the draft. If we had more cap space, I wouldn’t try and address every need via the draft but, as we all know, the current state of Jets’ cap makes it tough to do anything. Chase Thomas, OLB from Stanford; instead went undrafted but signed with the Saints. With the final pick, I think teams need to look for value more-so than in any other round. I couldn’t believe that Chase Thomas was available. I would have expected him to go no later than in the 4th round and was one of the players I’ve been tracking. I would have been pleased if the Jets drafted him in the 5th or 6th rounds but when he was still on the board in the 7th round, and the Jets passed on him again, I just shook my head. For him to fall that far, I think there must have been some negative info floating around the league that was not made public. NFL.com actually had him rated higher than the Cowboy’s first round draft pick! Anyway, the last time the Jets spent their first round pick the way I wanted them to was in 2008 when we drafted Vernon Gholston so I’m not going to get too upset. One thing the draft teaches us is that none of us really know anything anyway (except maybe Ozzie Newsome). I think the Jets draft choices give them the most opportunity for an immediate turnaround but they also carry with them the most risk. If Geno Smith can come in and play like Russell Wilson did last year, if Dee Milner can start right away and at a high level and if Sheldon Richardson proves to be the dominant force our scouts believe he is capable of, we could be in for a very nice season. However, when you have really high draft picks like the Jets had this year, I believe it is even more important to not miss. The safest picks statistically when picking 1-16 (according to The Harvard College Sports Analysis Collective) are at Linebacker and at Offensive Line. In this draft we had huge areas of need in those positions and had excellent draft prospects available to us in those positions. I think it would have made a ton of sense to draft Warmack and Jones but, that said, I wish our newest Jets the best and hopefully Geno proves to be a better seer than his new head coach… and yes, somebody did say Playoffs! An elite pass-rusher is simply not even close to our most immediate or pressing need and should not be addressed with our first draft pick. Many analysts believe that the Jets will take the best available pass-rusher with the 16th pick or, worse yet, trade up for a short-armed pass-rusher. While it would be great to have an elite pass-rush, an elite pass-rush by no means directly translates into wins. For example, neither of the two teams that were tied with the most sacks last season even made the playoffs (Minnesota and Philadelphia). Having an elite pass rush is simply not essential to winning – especially for the Jets. The Jets have arguably the best group of CB’s in the NFL. By having an outstanding secondary, it eases the need for defenses to have an outstanding pass rush. You need to be good at at least one to have a sound defense. If you can be great at one and even just average at the other, you’ll have a very good defense – which is what the Jets have. The Jets were in the middle of the pack last year in sacks. They were tied with the Pittsburgh Steelers at 17th in the league with 35 sacks. In each of the last three years, the Jets’ defense has been ranked in the top five (yds/g). 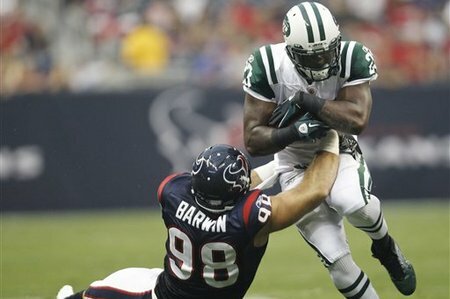 In 2009, when the Jets had the number 1 ranked defense, they had fewer sacks and were ranked lower in sacks than last season. It would be great if we could improve our pass rush through the draft, however, our other needs are too severe for us to afford that luxury. With our CB’s, it is possible to have a top defense while having just an average pass-rush. In a year when it seems that there are more holes in the roster than usual going into the draft, one, in my opinion, looms larger than any other. Offensive Tackle is a need that I believe needs to be addressed with our first pick. My choice would be Jonathan Martin. While he was once considered a top ten pick, following his lackluster pro day, his draft stock has fallen considerably. That said, his subpar performance at his pro day doesn’t detract from a stellar collegiate career at Standford. In addition to being of prototypical size, he is a highly intelligent player with high character and effort. Martin turned down the opportunity to attend Harvard. Had he opted to attend Harvard, he would have been the first fourth-generation African-American Harvard student. Martin is a player, like Furgeson and Mangold, that could be plugged into our line day one and be a stalwart contributor for the next 10 years. I think games are won from the inside out – the battle in the trenches is crucial. Inconsistent and poor play by the OL negatively impacts everything teams try and do offensively. QB’s can’t throw when given no time and RB’s can’t run when given no holes. Nothing else matters offensively if you’re line is not effective. The Jets were ranked 22nd in the league in 3rd down efficiency last season converting 34.6% of 3rd downs. In 2010, the Jets were ranked 11th in 3rd down efficiency converting 40.4% of 3rd downs. I believe the main reason for this sharp decline was the departure of Damien Woody. They are certainly big shoes to fill and, in my opinion, it should be the Jets number one priority. If we can improve that 3rd down efficiency, it obviously helps our defense. One of the core benefits of a ground and pound philosophy is to minimize the opponents offensive output by limiting their opportunities to score. It also helps to keep our defense fresh. Last year, the Jets lost several games in the forth quarter because the defensive gave up critical plays at the end of the game. Adding a solid RT will help our defense by extending our offensive drives thus keeping opponent’s offenses off the field and keeping our defense fresh. I thought Sanchez looked sharp. He went 6 for 7 and he should get a Mulligan on his one incompletion since it was a dropped by Matthew. It was nice to see some chemistry with Mason. It would have been nice to see Sanchez throw the ball down the field more but with a decimated offensive line, I’m glad he was only really asked to make the short underneath throws. When I saw the replay of Bart’s injury on the Texan’s fist offensive play, I felt like we dodged a bullet. That could have been very ugly. In one of Rex’s press conferences this week, Rex mentioned how savvy veterans like Bart have a feel for situations like this and that Bart was alert enough to let go so his body would fall with his leg. It is amazing that, prior to this injury, he had only missed 3 practices since coming into the league in 2002. One of my major concerns coming into this season was depth at ILB and when Bart went down, I was certainly holding my breathe. While we’re all rooting for Bart to come back soon and healthy, it was a pleasant surprise to see Josh Mauga come in for Bart and on his first two plays have a tackle for a loss and sack. The most glaring struggle of the Jets defense was covering RB’s and FB’s. Running-backs and Full-backs accounted for 9 of the Texan’s 16 completions. While you’d certainly expect a higher completion percentage to RB’s and FB’s given the depth of their typical routes, the numbers in the Texans game were stark. The Texan’s Quarterbacks completed 82% of their passes to RB’s and FB’s and just 35% of their passes to WR’s and TE’s. 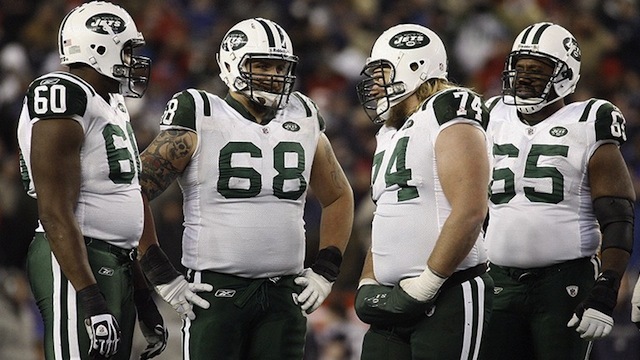 The most glaring struggle of the Jets offense was their offensive line. In all fairness to them, they didn’t have Mangold or Moore but their performance was nonetheless poor and cost Rob Turner about 3 months. Ducasse obviously needs to step his game up significantly. I feel for the guy in that he keeps getting shuffled around from position to position but the coaches wouldn’t be doing that unless they thought he could handle it. After the one play where he was beaten badly to the outside, the ‘b’ word started floating around in my head. However, after the heat of the game, I shed those thoughts. For one, on that particular play, Rex mentioned in one of his press conferences this week that they went to a silent count without Ducasse knowing. He was beaten so badly because he didn’t know the ball was snapped. Also, offensive lineman can take a while to develop. We all knew Ducasse was a developmental project when he was drafted. We can take some comfort in knowing that he has one of the best offensive line coaches in football. Wayne Hunter has been in the league since 2003 and never started a game until he started once for the Jets in 2009. Last year he had 4 starts and this year, he’ll hopefully start 19. I like Westhoff’s kick return strategy of returning kickoff’s even from deep within the endzone. I’ll probably write another post on this later. Kerley is going to be fun to watch. I thought Shonn Greene looked good. He had a nice run and it was great to see him catch a ball out of the backfield. I thought Joe McNight looked pretty good though the play-calling for him could have been better. He ran a lot between the tackles and I think he’d be better utilized on the edges where he can leverage his quickness in space. Also, there’s no way he should be expected to block an untouched rushing LB with a full head of steam – someone should have at least chipped Reed before he got to McNight. McNight didn’t even slow Reed down; it was like a fly hitting a windshield. When the rosters are as big as they are for the first preseason game, I know it’s nearly impossible to work everyone in but I was really hoping to see what Scotty McNight in action. Hopefully he’ll get some targets this Sunday evening against the Bengals. I am very pleased with how Greg McElroy played. I wrote a post before the Jets draft stating that they should draft a QB and I was thrilled when they drafted McElroy. He’s knows how to win – he won the Texas state championships in High School and a National Championship in College. His accuracy and smarts remind me of Chad Pennington. In the Texan’s game, he reminded me of another Jet, Ken O’Brien, in that he showed he’s as tough as nails. He got pummeled when he first got in the game. On the play where he fumbled, with the way his head hit the turf, I thought for sure that he sustained a concussion. With about 5 minutes left in the 2nd quarter, I thought the Jets did a good job of adjusting their play-calling. They gave him a bunch of short dump-off passes to gain some momentum and confidence while slowing down the Texan’s pass-rush. For only spending a couple of weeks at an NFL training camp, I thought he was remarkably poised and had a natural command of the game. Furthermore, I’d be curious to see if he could improve his accuracy even more if he didn’t take helmet-wearing advice from John Hall. I think he’ll be great in the quarterbacks room and will become a more-than-adequate back-up for Sanchez. Playing back-up is something that McElroy has done before. In High School, as a sophomore and junior, McElroy backed-up Chase Daniel, who later contended for the Heisman Trophy while playing for the Missouri Tigers. I’m very glad he’s a Jet. It’s tough to zero in on non-skill players when watching the game on TV but it looked to me like Kendrick Ellis held his own. I’m looking forward to seeing the Jets play Bengals in person to watch him more closely. Lineman are obviously coached to get their hands in the air to disrupt passing lanes when they don’t get penetration but it’s not too often that they successfully knock down a pass. It was nice to see Ellis do it and it might be an indication that he has some good natural instincts. We know he has the frame and the Monday Night Football broadcast crew was quick to point out Ellis’ unusual speed, range and motor for a big man. All this gives us good reason to get excited about him. That said, I’m still bummed that Jenkins is no longer our man in the middle. Cumberland looks like he could make some nice contributions to the team this year. I think both Cumberland and Keller will benefit from having Tom Moore on the coaching staff. Moore loves to utilize his TE’s. Cumberland caught 6 of the 8 passes that were thrown in his direction and averaged almost 13 yards per reception. In the upcoming Bengals game, I expect the offensive line will play significantly better. I also expect that the RB’s and FB’s won’t have nearly bonanza that the Texan’s backs had receiving the ball. I’m looking forward to seeing McElroy throw the ball downfield more and to see which WR’s step up and seize their opportunity. The Texans only averaged 2.2 yards per rush against the Jets. I’d like to see the Jets young defensive line have another solid outing.